Our range of products include mechanical hygrometer. 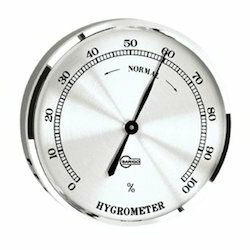 We are involved in importing, manufacturing and supplying of Hygrometer Mechanical. Hygrometer is an mechanical instrument for ascertaining the presence of water vapors in the air at specific temperature. Modern hygrometers are based on digital technology and widely used in domestic houses, offices and commercial places to ensure comfortable conditions inside the premises. Our range of Hygrometers is highly recognized for accurate measurement and slim design. Looking for Hygrometer Mechanical ?